DeMarcus Cousins doesn't seem to go fishing very often, but when he does, he seems to make the best of it. Big fish for a big man! I mean, the first fish that he ever caught in his entire life was an 11 pound salmon. The first fish that most normal people like you and myself included, would most likely have been something like a half pound sunfish. The following are a few social media posts and fishing pictures of DeMarcus Cousins getting boogie with it out on the water, when he isn't conducting business on the basketball court. DeMarcus Cousins with a swordfish he caught fishing. In this twitter post from 2010, he tweeted that he caught his first ever fish, which was an 11 pound salmon. Because twitter had not yet enabled posting pictures during that time, the tweet appears to contain a link to ImageShack to view a photo of the salmon he caught. This instagram post was tweeted by Blake Ellington (a writer and communications expert that covers the Sacramento Kings for Sactown Royalty). I looked through DeMarcus Cousins' instagram posts and cannot seem to find this one. I assume that he must have deleted it since. He's obviously just enjoying a nice day out on the lake, sitting on the edge of the boat, fishing with a baitcasting rod and reel combo, and waiting for the strike. A couple months later he posts this Instagram picture of a swordfish that he caught with the caption saying "First catch of the day...". 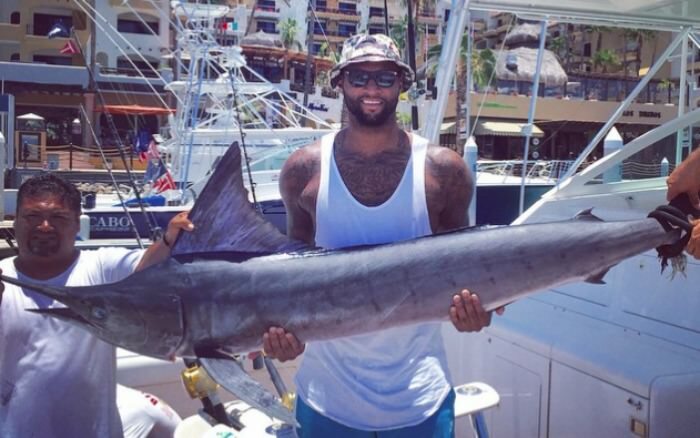 Hopefully we will get to see more of DeMarcus Cousins fishing adventures in the near future. DeMarcus Cousins is an NBA All-Star and USA Basketball Olympic Gold Medal Champion. He is a big man that plays the power forward and center position. He is considered as one of the best big men in the league, as well as in the world, today. He's a high scoring guy that can also shoot 3 pointers well. He is an efficient rebounder (often having double-double games for double digit points and rebounds), he can block shots, and he's strong, yet agile enough to get to the rim almost anytime that he wants. He played college basketball at Kentucky. He was drafted 5th overall in the 2010 NBA draft by the Sacramento Kings. After nearly 7 seasons, he was then traded to the New Orleans Pelicans during the 2016/2017 season. DeMarcus also goes by the nicknames of "Boogie Cousins" or DMC.